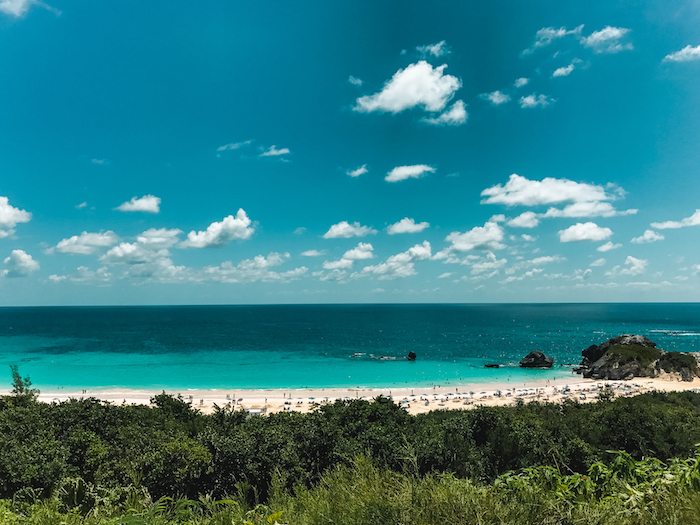 If you follow me on Instagram, you probably already know that Bermuda is absolutely beautiful! But, I wanted to share with you my travel diary and guide for the island. If you follow me on Instagram, you probably already know that Bermuda is absolutely beautiful! But, I wanted to share with you my travel diary and guide for the island. Damien and I visited for 5 nights to attend a friend’s wedding. While we had a few days of wedding festivities, we managed to visit some sites and explore. Here are the places we stayed, visited and enjoyed! The Loren is a beautiful, boutique hotel located at Pink Beach. The rooms have stunning ocean views and the beach and pools are perfect. Damien and I made sure to give ourselves plenty of time to just chill. We spent hours lying out, drinking “Rum Swizzles” (more on these later) and reading poolside and on the beach. There’s also two delicious restaurants and a luxurious spa on the premises. We totally got a couples massage and it was heavenly. Breakfast was regularly on our ocean view patio and lunch at The Pink Beach Club. All in all, The Loren was the perfect splurge experience and we can’t wait to go back! Hamilton is the capitol city of Bermuda. It’s a small area of pastel-colored shops and a harbor. There are bars and restaurants along Front St. and it’s just an adorable, little town. It was from here, where we took a sunset cruise for the wedding’s rehearsal dinner. There are tons of cruise tours to choose from if you visit and I highly recommend one. Bermuda is a water town and that’s the best way to see it, from the water! The Crystal Cave tour is a must-see in Bermuda. It is one of the most fascinating things I’ve ever seen with an incredible discovery story to match! I won’t give it away but if you’re ever in Bermuda, please visit this natural wonder. After your Crystal Cave tour, head down the road to The Swizzle Inn! We we’re told by a local that they have the best Rum Swizzles on the island, so we had to check it out. I think that guy was right. These Swizzles came in 1/2 and full pitcher sizes and were delicious! But, if I’m being real, so were all the Rum Swizzles we had on the island. We went to Bermuda for a wedding so seems silly not to mention the wedding location. Our beautiful friends got hitched on the beach at sunset. The ceremony and reception both took place at The Beach Club of The Fairmont Southampton. This is a much larger hotel than The Loren but I hear it’s nice. My favorite part was the beach decor; striped everything! The wedding was beautiful and perfect. One place we ate and loved was Harry’s Restaurant & Bar. Overlooking Hamilton Harbor, Harry’s was a great spot for seafood and (you guessed it!) Rum Swizzles! The seafood was spectacular and so was the service. For our last full day in Bermuda, we wanted to do something fun and adventurous. So we rented a tiny boat that Damien captained and spent the day at sea. I’m not going to lie, the thought of this terrified me and the first 20 minutes were a little scary but…Damien quickly became a pro and it was lovely. We rented a Boston Whaler boat via Fantasea Diving & Watersports at The Royal Naval Dockyard. This company offers everything from kayaking and scuba diving to turtle tours and private charters. We took our boat and followed a map in search of beaches to anchor near and a sunken ship to visit. It was all very exciting. We swam, we drank (that’s right more Rum Swizzles!) and took in the sights. It was the perfect ending to a perfect trip! So as you can see Bermuda is one very special place. Lucky for us, we have two great friends who live there and plan on visiting time and time again. Oh and don’t worry, Damien and I made sure to buy some Gosling Bermuda Rum at duty free to bring home. Guess what we’ll be making with them?…RUM SWIZZLES! I couldn’t possibly end this post without including a recipe to our new favorite drink for you! Fill a pitcher a third of the way with crushed ice, and add all the ingredients. Churn vigorously until frothing (or shake in a large shaker), and strain into 4 rocks glasses filled with fresh ice. Garnish each with an orange slice, a pineapple cube and a cherry.